Rebound nystagmus is a primary position nystagmus which is provoked by prolonged eccentric gaze holding. It appears after the eyes are returned to primary position. Normal subject -- no significant nystagmus appears after 10 seconds of eccentric gaze holding. Abnormal subject -- on the top panel (position), there is gaze evoked nystagmus beating to the right. When the eye returns to center, there is a left-beating nystagmus. 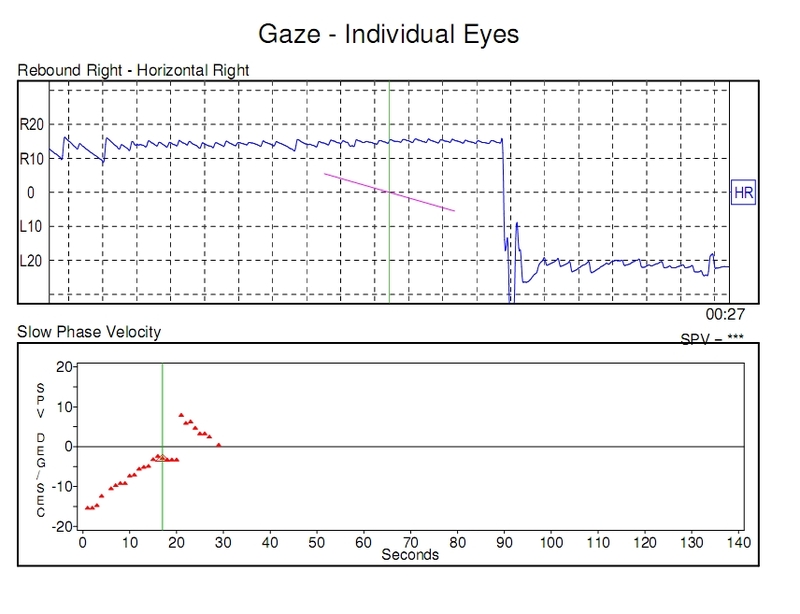 Eye velocity gradually declines during gaze holding to the right, and also decays after return to center. Image courtesy of Dr. Dario Yacovino. CT scan of subject to left showing damage to the right cerebellar hemisphere. Image courtesy of Dr. Dario Yacovino. 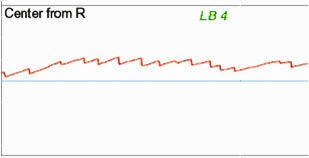 An abnormal amount of rebound in the light, as shown above and below, consists of at least 3 beats of clear nystagmus, with the slow-phases directed towards the previous position of gaze. It must reverse direction according to the direction of previous gaze. When using the video-frenzel goggles, at least 5 beats should be observed. Rebound Nystagmus -- a right-beating nystagmus occurs after 10 seconds of gaze holding to the left. 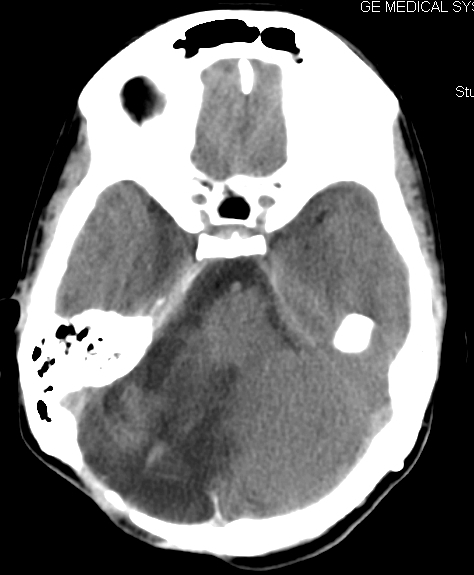 This patient had a cerebellar disturbance. Supplemental material on the site DVD: Video of rebound nystagmus. Supplemental material on the site DVD: Video of rebound nystagmus in patient with SCA-6, courtesy of Dr. Dario Yacovino. 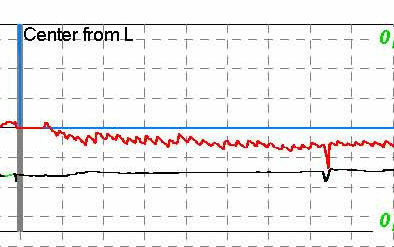 Rebound is nearly always pathological, and is mainly related to brainstem or cerebellar disease (Lin et al, 1999). Accordingly, if an unusually large gaze-evoked nystagmus is observed, one should automatically look for rebound nystagmus. 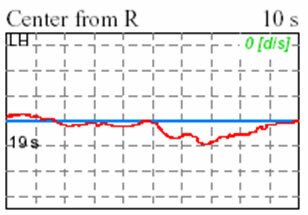 On the other hand, gaze-evoked nystagmus without rebound is usually of little significance. Rebound is always associated with poor smooth pursuit, but the poor pursuit does not inevitably mean that the person will have rebound. Rebound nystagmus in patient with myotonic dystrophy -- type II. 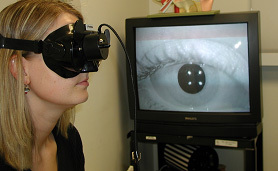 Rebound using the video goggles is usually a sensitive and specific sign of cerebellar disturbance. Clinical situations in which rebound is commonly encountered include MS involving the pons, typically a lesion of the middle cerebellar peduncle, and ischemic pontine hypertensive lesions. Rebound nystagmus is also a feature of EA2 (Episodic ataxia, type 2). Rebound also can occur in congenital nystagmus, but it is not at all a universal feature of CN.